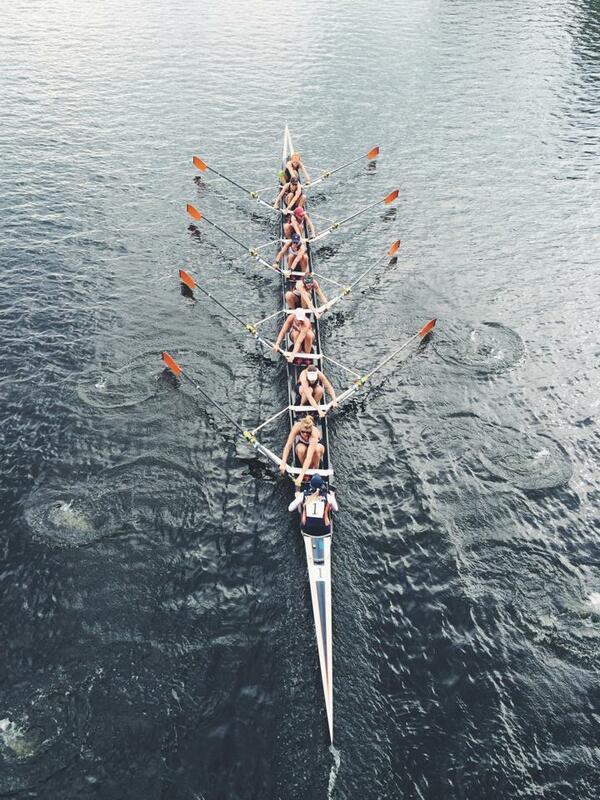 A couple of weekends ago (October 18-19th) marked the 50th Anniversary of the Head of the Charles Regatta (HOCR). Like thousands of other loyal, devoted rowers I made the pilgrimage with my partner, Ellen Tomek to Boston to take part in this annual celebration. The Head of the Charles is the world’s largest two-day rowing event. Attracting over 11,000 athletes and nearly half a million spectators, this regatta is basically the Super Bowl of rowing. This year I raced the Women’s Alumni 8+ on Saturday and the Directors’ Challenge Mixed Quad event on Sunday. These events are very much fun races for me and a great way to enjoy the weekend away from the pressures of everyday training for the women’s double. Just because they are “fun” does not mean they aren’t competitive. 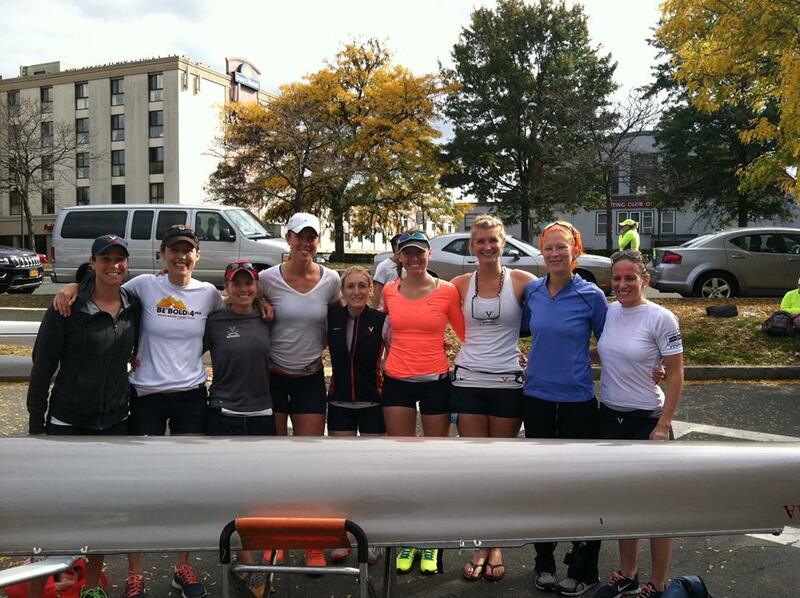 The Women’s Alumni 8+ has become especially fierce with several former and current National Teamers returning to race the Charles with their respective alumni boats. For the past two years I have been fortunate enough to have an honorary seat in the University of Virginia Women’s Alumni boat, even though I was not a rower at UVA (I was a volleyball and softball athlete). Since the inception of the alumni races in 2009, UVA has won three Head of the Charles gold medals. Last year we beat the reigning champs, the University of Michigan, in addition to crushing their course record set the previous year. It was an awesome race, but I knew the Blue would be out for blood this year…and they got it. Michigan stacked their boat full of National Team athletes, including my partner Ellen (which makes this ongoing rivalry all the more interesting). I’d be remiss if I didn’t mention that we had our share of former and current National Team athletes in the Virginia boat as well. Their coxswain steered a flawless course and they crushed us (and our 2013 course record) by a solid 18 seconds. We had to settle for second place out of 42 entries. Not too shabby, although I might still be a little bitter about the smack talking that went down as Michigan passed us in the last few meters before the finish line…. This year was also the second year I raced with Beat Cancer Boat Club in the Directors’ Challenge Mixed Quad event. My teammates and friends Brian Tryon, Mike Sivigny, and Michelle Nielsen came together last year to race in honor of all who have faced cancer and most especially for Brian’s wife, Pam Besteman, breast cancer survivor and founder of BCBC. Sunday was a blustery day with a prevailing headwind which made conditions slower and more difficult. We had a decent race, putting up the second fastest overall time and placing 4th with the age handicap–those dang handicaps. On top of being the largest two-day regatta, the Charles weekend has become the ultimate rowing reunion. For a few days, the city is literally overrun by giant, athletic men and women. As this was my fifth Head of the Charles to attend and fourth to race, the weekend has become an annual tradition and staple in my schedule. In my four short years of rowing, I’ve been lucky to have made friends and met so many great people from all over the country and world. I love heading to Boston, knowing I’ll get to see some old faces and probably make a new friend or two. The Monday following HOCR, Ellen and I caught a 6am flight all the way back to Oklahoma City in time to get in two training sessions. Just like that, the “row-cation” was over. While I was utterly exhausted from the weekend and travel, I couldn’t help but feel rejuvenated in a way. While in Boston, I had the chance to reconnect with several of the people who played a big part in getting me to where I am today: from the Master’s women who I first rowed with at Riverfront Recapture, to Pam and Brian who literally taught me how to carry my first single, to the UVA coaches who continue to support me in so many ways even though I was never one of their athletes, and to my fellow National Team athletes scattered around the country who continue to inspire me to work harder every day. The good lucks, hugs of support, and congratulatory pats on the back really do go a long way, and I left the weekend revived and recharged, ready to take on a long, tough winter of training to prepare for next summer’s Olympic qualification. So glad you have enjoyed “The Charles” four times over! It is the singularly authentic head race in our country (in my opinion…). It was what drew me into the sport when I lived and worked in Boston for 13 years. The Community Rowing program (CRI) of Boston was my gateway. You captured the event very well in your post and the comraderie is genuine when you are there. Nice to see you had a ‘break’ from your training. Good luck in the weeks ahead!